The palace intrigue of the Trump administration has become a drama of media speculation. What will happen next? Who will go and who will stay? Courtiers may vie for power and position in the Trump administration, but the king is Donald Trump. Gaining his ear is the route to a lasting impact and legacy. If you get closer to the flame you may get warmer but you also may get burnt. Right now the moving pieces in President Trump’s inner circle seem to center on Media Strategist and former Breitbart editor, Steve Bannon White House Chief of Staff and former GOP Chairman, Reince Priebus, and Trump’s son-in-law real estate developer and market advisor, Jared Kushner. Let’s handicap the odds for the lineup, based on the Game of Thrones character each real-life player resembles. The goal is to last through the end of Season 8 in the HBO television show, which would be Book 7 in the Series a Song of Ice and Fire and Year 4 in the administration. 2-1 Steve Bannon as Grand Maester Pycelle. The longest odds at this stage go to the master strategist Bannon. The champion of the populist nationalist movement Bannon favors science to religion and may over estimate his own role in the Trump movement. Like Pycelle viewers are left wondering about his off-screen peccadillos. Spoiler alert: Pycelle gets wacked by the “little birds” of Qyburn taken from Varys when Cersi takes over. This shift in power completely upends the small counsel structure that Pycelle depended on. 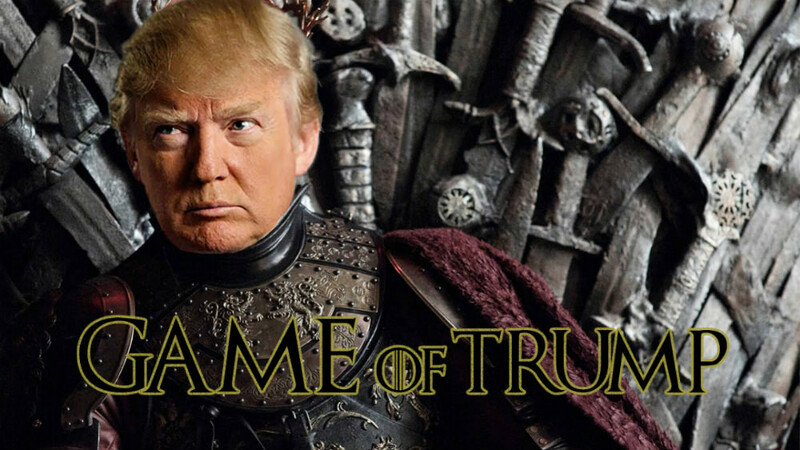 A similar fate would await Bannon if Ivanka, who is most like Cersi, and Kushner hatch a plot with an insider and mastermind like H.R. McMaster. Thus, in this world Bannon is on the short list of advisors to bite the bullet. 3-4 Reince Priebus as Lord Varys. Priebus has the inside track, he’s adaptable and crafty. 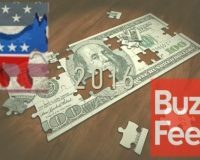 Going from the RNC to the Trump administration is no small feat. Priebus provides the organizational skill, network and the ground game that Trump needs. But, these are relatively expendable and replaceable traits in Trump World. Priebus may hitch his wagon to the next star, like Varys and the up and coming Queen of Dragons Daenerys Targaryen. This would at least prolong his screen-time. And if he’s able to parley his wits with a Trion Lannister imp-strategist like Mitch McConnell he could find a route back to power. Still he needs to keep Kellyanne Conway in his back pocket like the Queen of Thorns, Olenna Tyrell. 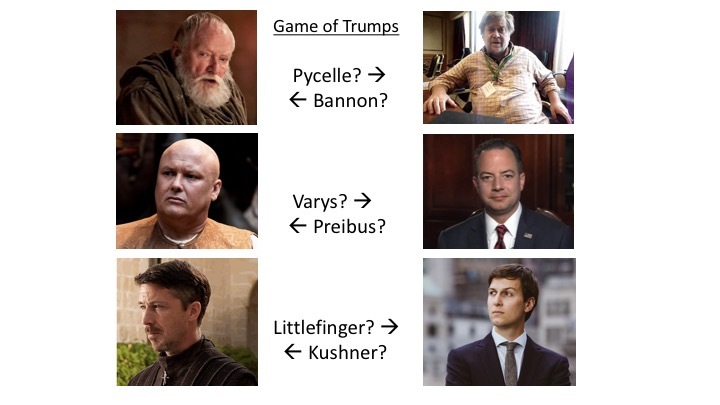 3-2 Jared Kushner as Peter “Littlefinger” Baelish. The favor in the clubhouse is the family connected Kushner. He has allied himself with the north, that is the New York, Wall Street and the Bravos, banking axis. His strategic planning is apparent with big data and marital relationships. It remains open whether he can weather the storm. As we know Winter is Coming.